I’ve probably walked through the Union Square farmer’s market a thousand times by this point in my life. That’s not all that surprising; I’ve lived in the vicinity for most of the past 23 years. What is surprising, though, is that it was only last spring that I actually slowed down enough to really take in what was piled on the tables around me — a change due to no other reason than that I had a camera pressed to my face (I was on a quest to capture some images for the Dorie Greenspan story that ran here in early July). You see like many New Yorkers, I tend to find myself in the midst of the farmer’s market while en route to somewhere else — the subway, most often, or an appointment on the other side of the square. That, or I’m making a beeline for the tomatoes, or an oatmeal raisin cookie, or a jar of honey. But whichever the case, I’m usually short on time with someplace else I need to be. Which means that giving myself the luxury to meander freely among the various stalls, with no schedule or shopping list to distract me, has not typically been part of my farmer’s market experience. So my visit last spring was a little like what I imagine a person who finally relents to putting on a pair of glasses must encounter. 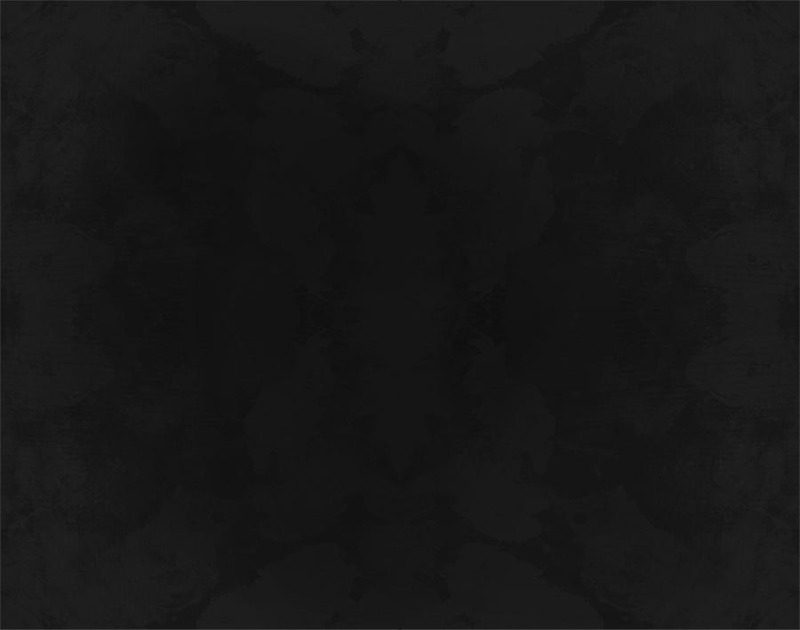 Everywhere I looked were mountains of the most vividly colored fruits, flowers, and vegetables I’d ever seen — beets in deep purple and orange; radishes in crazy shades of fuschia; leeks as thick as a baby’s arm, so bright they looked like they’d been dipped in a can of kelly green paint and placed on the table to dry. I felt as though I’d just been airlifted out of the desert and dropped, if not into the Garden of Eden, then at least to the place where much of its produce is sent. Since then I’ve tried to slow my pace a little when entering the market, and while I’d say I’ve been only moderately successful in this (I’m still scrambling to get to that appointment on time), there’s no question I’m seeing more too. Take last Friday. Once more I found myself in the midst of the market, and once more I was on my way to somewhere else, but despite the fact that I was running late and the market was unpleasantly crowded (it was a warm, sunny day), I managed to actually lock my eyes on something other than the fastest route to the subway entrance. Of course, the market in late October is a very different place than it is in April, but there was still plenty to admire: tidy piles of purple onions; baskets of heirloom tomatoes in vibrant shades of red, orange, and yellow; even a few bins of local Brussels sprouts — the first of the season. 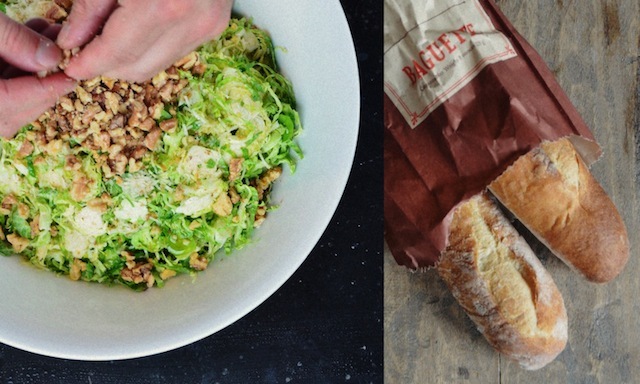 That sprout sighting was a source of particular excitement for me, because even though Brussels sprouts are generally available year-round, their true season is from right about now until mid-February, which means that this is the moment to make the most of them. As you might have deduced, I’m a big fan of these green little orbs. I love their slightly bitter, metallic taste and the way it mellows when introduced to some melted butter and a splash of lemon juice. I love the way they caramelize and sweeten up when blasted in the oven for ten minutes or so. And I love the way even those who say they aren’t fans are instantly converted once a plate of shredded sprouts, mixed with a little cider vinegar and some roasted nuts, is placed in front of them. For me the sprout is the perfect canvas for fall flavors, be it a dusting of salty cheese, or a roasted pecan dipped in Maple syrup. Which brings me to this week’s recipe — a new favorite from an old issue of Gourmet. 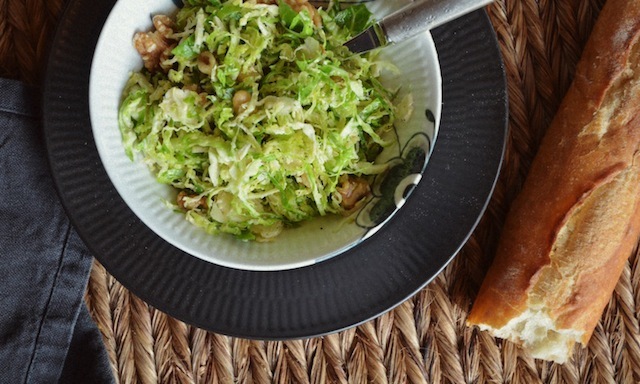 It’s for a shredded Brussels sprouts salad with walnuts and Pecorino, and is one I was inspired to search out when I came across Mark Bittman’s recipe for a Brussels sprouts and peanut slaw in the New York Times Magazine several weeks ago. That recipe caught my eye for its star ingredient, but as I contemplated making it I realized that what I was really yearning for was the sort of salad I’ve sampled at various restaurants around the city over the years, places like Cookshop and Buvette that tend to focus on seasonal ingredients and big, satisfying flavors, and where their Brussels sprouts salads have made ample use of such enticements as cheese and lemon juice. As it turns out this recipe is very close to the one Jody Williams, the chef and owner of Buvette, seems to have been working with — though she’s something of a magician and is no doubt plying her own particular alchemy on the various ingredients featured. Still, even without the Williams touch, I was able to assemble something wonderfully satisfying, and with relatively little effort. 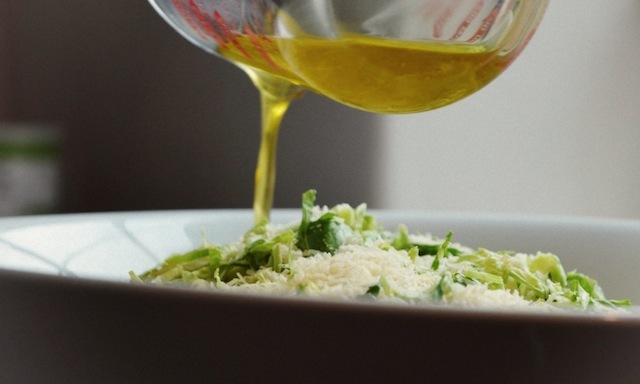 The recipe couldn’t be easier, with just a shredding of the sprouts (as thin as you can manage), then a tossing of the resulting slaw with a cup of lightly roasted walnuts, some good quality olive oil, a bit of fresh lemon juice, and a generous sprinkling of Pecorino Romano cheese. I say “generous” because the recipe calls for only 2 tablespoons, a quantity I more than tripled (to 7 tablespoons). Of course, Pecorino can vary in salinity, but even though mine was quite salty I still felt as though the sprouts needed the increased volume of cheese to mellow out its bitter quality, and to amplify the salad’s richness. Ditto the lemon juice, which I doubled from 3 tablespoons to 6. One other minor adjustment: instead of serving the assembled salad immediately as the recipe suggests, I let it rest for fifteen minutes or so. This gave the cheese a moment to melt into the oil and lemon juice, and for all of it to break down the shredded sprouts ever so slightly. It’s the difference between a dish that’s just this side of dry, to one that tips into lushness, even decadence — perfect as a side dish, or a healthy meal all on its own. Either way, it’s just the thing for fall. 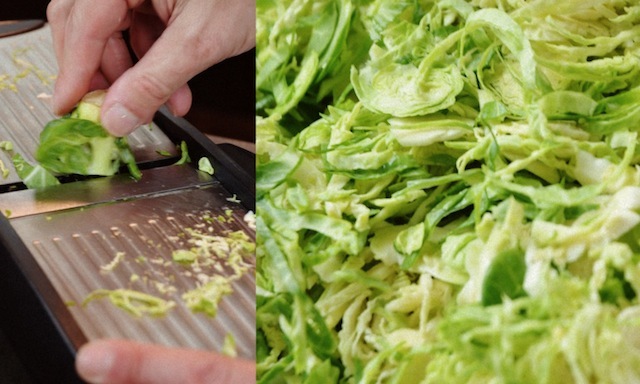 —Holding each Brussels sprout by stem end, cut into very thin slices using slicer. Toss in a bowl to separate layers. —Preheat oven to 350 degrees. 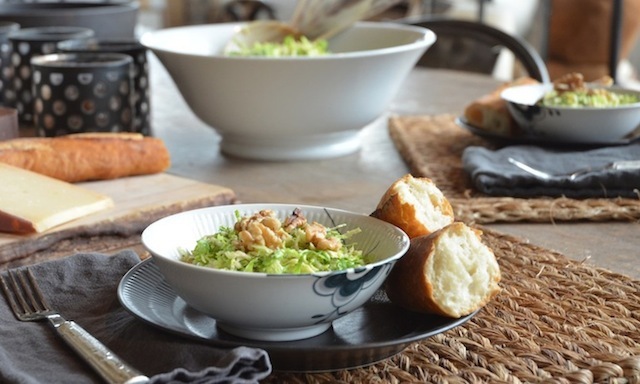 In a baking pan toast walnuts in middle of oven, 10 to 15 minutes, or until lightly colored. 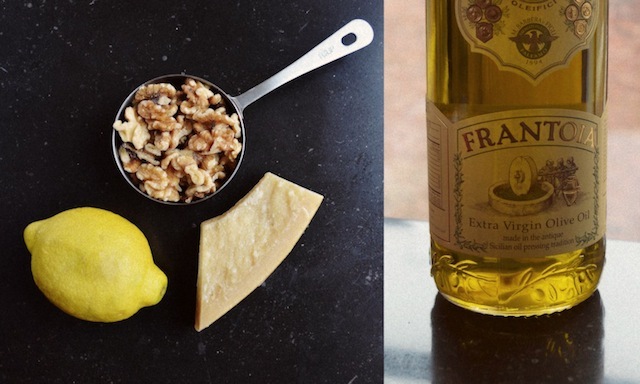 Lightly crush walnuts with your hands and add to Brussels sprouts along with cheese, oil, and lemon juice, then toss to combine. Season with pepper. 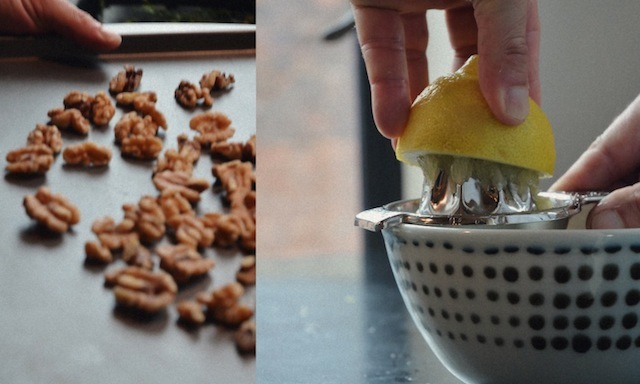 Note: Walnuts can be toasted 1 day ahead and kept in an airtight container at room temperature. 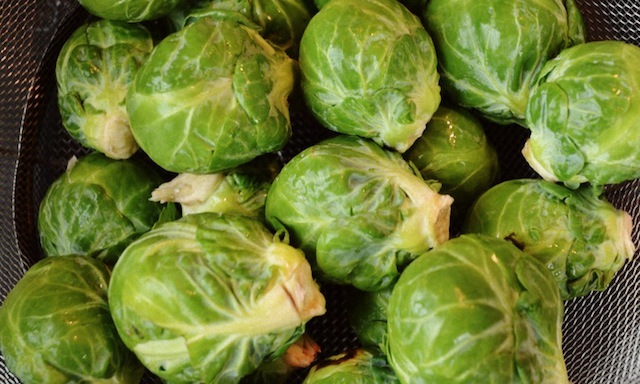 Brussels sprouts can be sliced up to 3 hours ahead and chilled, covered. I've got a strong feeling that I am going to be converted to loving Brussels sprouts. Photos look great, I want some. Exquisite! I can really taste this one even before it's made. Thank you thank you!